Back in 2013 we had a gathering with Sheree Tompkins on Homemade Laundry Soap. Her recipe can be used in standard or HE (high-efficiency) washers because it is a low-suds recipe. This posting offers another HE option, from Wellness Mamma (2). 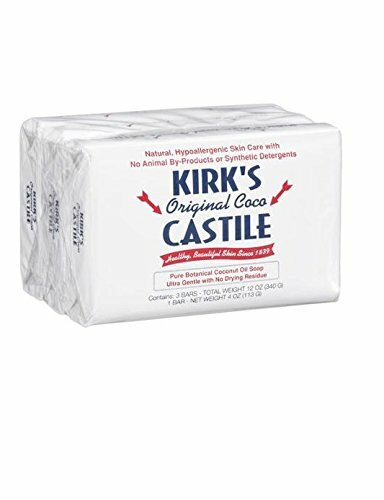 Like Sheree’s recipe, this one also requires grating a bar of real soap, such as Kirk’s Castile pictured above, Dr Bronner’s Pure Castile bar soap, homemade soap (see also Gathering Summary: Making Soap at Home, by Kathy Mansfield, January 26, 2011). Fels Naphtha is an old-fashioned option but has some questionable ingredients if you care about the environment. Also included is Wellness Mamma’s borax-free laundry cleaner (two ingredients added separately to the washer). Washing soda is sodium carbonate (Na2CO3); the most common brand is Arm and Hammer. 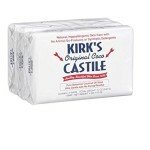 It is more alkaline (caustic) than baking soda (sodium bicarbonate), which makes it a better cleaner. Some grocers carry it; it is also available online such as Amazon. I could not find any data that was compelling enough for me to avoid natural borax powdercompletely. Obviously, I would not ingest it or feel comfortable using it in cosmetic or food preparations. At the same time, most products I use borax in (like All-purpose Cleaner and Laundry Detergent) aren’t coming in direct, undiluted contact with my skin, I’m not ingesting them and I’m not getting them in or near my eyes, so most of the concerns and warnings with borax are not valid. However, if you prefer not to use borax, Wellness Mamma offers other options (2). Sal Suds is a ‘natural’ detergent that contains sodium lauryl sulfate as the second ingredient. Other ingredients are (7): Water, Coco-Betaine, Decyl Glucoside, Abies Siberica (Siberian Fir) Needle Oil, Picea Glauca (Spruce) Leaf Oil, Citric Acid, Sodium Sulfate, Sodium Chloride, Potassium Hydroxide. Oxygen booster is a combination of ingredients that break down into harmless, biodegradable water, oxygen and soda ash to clean stains (9). See Live Simply blog for instructions on making your own (8), or purchase a product such as Oxi Clean or Nellie’s All-Natural Oxygen Brightener (6). Grate the soap using a hand grater or food processor. Grate into fine particles so it dissolves easily. Use 1-2 tablespoons per load. Add 1 tablespoon of oxygen booster if needed… [such as for] white loads. Optional: add ½ cup white vinegar to the rinse cycle [helps remove the soap from the fabric, and neutralizes the alkalinity of the soap]. Just add those at the beginning of the wash cycle. This entry was posted on Sunday, February 12th, 2017 at 1:00 pm and is filed under Ecology, Home & Ranch, Kitchen Hints. You can follow any responses to this entry through the RSS 2.0 feed. Responses are currently closed, but you can trackback from your own site.